The Anglican Centre in Rome is the Embassy of the Worldwide Anglican Communion to the Roman Catholic Church. 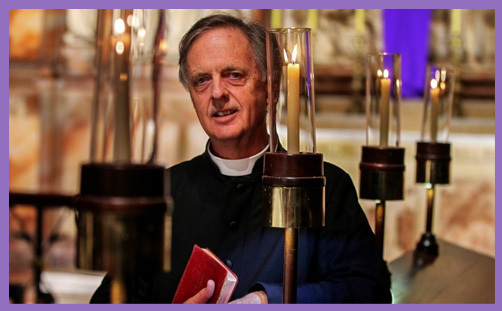 Its Director is effectively the Archbishop of Canterbury’s Ambassador to the Vatican; Justin Welby’s personal representative to the Holy See, tasked with pursuing peace and justice in the world and the promotion of Christian unity. Last year the Centre’s director Archbishop Bernard Ntahoturi was forced to step down after only a year in office, following an undisclosed allegation of sexual misconduct, and the Governing Body took swift and urgent steps to appoint an interim director to restore the mission’s theological reputation and diplomatic standing. The Interim Director is the Very Rev’d Dr John Shepherd, formerly Dean of St George’s Cathedral, Perth, Australia (and Chaplain of Christ Church, Oxford, 1980-1988). The Governing Body of the Anglican Centre in Rome no doubt carried out all the necessary due diligence to ensure Dr Shepherd’s impeccable record of sexual behaviour and moral probity. What a pity they didn’t delve into his theological orthodoxy. He denies the physical resurrection of Jesus. …Jesus’ early followers felt His presence after His death as strongly as if it were a physical presence and incorporated this sense of a resurrection experience into their gospel accounts. But they’re not historical records as we understand them. They are symbolic images of the breaking through of the resurrection spirit into human lives. …Jesus lived… as a transformed spiritual reality. This is the creed of Anglican Communion’s current ambassador to the Roman Catholic Church. You may say he’s only interim; appointed temporarily to steer the ship and do the paperwork, but it doesn’t take long to cause still further damage to the reputation and standing of the Anglican Centre in Rome. How can Dr Shepherd possibly represent the Archbishop of Canterbury at any diplomatic function in the Holy See when he will very soon be (if he isn’t already) persona non grata? How can he possibly represent the Anglican Church at any university or ecumenical gathering when he refutes fundamental Christian doctrine and theological orthodoxy? He would insist, of course, that he doesn’t deny the Resurrection of Christ, merely the bodily resurrection. So Jesus didn’t actually say he would rise again physically on the third day, the tomb was not actually empty, and Thomas didn’t really put his fingers into any crucifixion wounds. These are merely literary allegories, theological symbols, according to Dr Shepherd, designed to inculcate faith and a sense of salvation. The disciples (inter alia) experienced collective hallucination because they felt Christ’s presence: there was no physical miracle; just visions of a “transformed spiritual reality”. If this is true and Dr Shepherd is right, then the Church of Jesus Christ (and so the mission of the Roman Catholic Church) is founded upon nothing but the pathological fantasies of first-century religious fanatics. There was no physical resurrection; just excited apostolic optical nerves. Those disciples and apostles who went on to be crucified, stoned, stabbed, beheaded or burned for their faith all died for nothing but a moment of transcendental ecstasy: they weren’t martyrs or moral heroes, but highly-strung mystics and nervous proselytes. If the Resurrection of Christ is just a “sense” or a “symbolic image”, then what was his birth and passion? Did they really happen, or are they, too, just ancient images of messianic promise? If the Resurrection of Christ is not literal, what of the Cross and his death? Did Christ really suffer and die for our sins, or are we still dead in sin because he never actually conquered death? How could the entire sub-apostolic age have got this so badly wrong? Were the Church Fathers all hallucinating as they laboured over their expository treatises? How could these great theological minds all fail to discern such a vicious lie and heartless hoax? Does the Interim Director of the Anglican Centre in Rome really know more than Clement of Rome, Justin Martyr, Ignatius, Polycarp and Tertullian, who all affirmed the physical resurrection of Our Lord? Does Dr Shepherd deny the testimony of the Fathers because he believes them to be as untrustworthy and collectively deluded as the Apostles? There are probably three or four sorts of people who might be considered unsuitable to represent the Archbishop of Canterbury to the Holy See: i) someone who believes the Pope of Rome is the Antichrist or the Roman Catholic Church is the Whore of Babylon (this wouldn’t be conducive to flourishing ecumenical relations); ii) someone who was once Roman Catholic but converted to Anglicanism (ditto above); iii) a female bishop (which would be rather a slap in the face); and iv) someone who denies the Trinity, the Virgin Birth, or the physical resurrection of Christ (which would cause the Pope and the entire Apostolic Nunciature to wonder what on earth the Archbishop of Canterbury was playing at). You wouldn’t expect the British Ambassador to Saudi Arabia to be on the record as saying Mohammed was a false prophet and the House of Saud a bunch of evil murderous thugs and sponsors of global terrorism, would you? Such utterances wouldn’t exactly be conducive to flourishing diplomatic relations. It would appear that, in a moment of blind panic to move swiftly on from allegations of sexual impropriety, the Governing Body of the Anglican Centre in Rome appointed the Very Rev’d Dr John Shepherd on the recommendation of their Chairman, Bishop Stephen Platten. Everyone trusted his judgment, including Lambeth Palace, which recently awarded him the Lambeth Cross for services to Ecumenism. Since he has stepped down, he won’t have to deal with the fallout from any of this: other members of the Governing Body will now have to pick up the pieces, and doubtless some will point an accusatory finger at Justin Welby. This would be an unjust impeachment: one would expect to be able to trust the discernment and judgment of senior staff to make an interim appointment, wouldn’t one? But there is a lesson here: in its obsession with ensuring the impeccable sexual morality of its clergy, the Church is in danger of ignoring the need for theological orthodoxy. There’s no point weeding out sinners and hypocrites from Church leadership if you then appoint those who preach a false gospel which offers no hope of salvation and gives no-one an assurance of anything .